I needed a new "thought for the moment", and I found one this evening while re-shelving a book I've been intending to read for the last few months. The Forward to Freedom and Destiny caught my eye. This should give you a picture of why this one is on my "must read soon" list. This morning a friend and I canoed out on a perfectly still and silent New Hampshire lake. The only ripple on the water's surface came from a great blue heron as it languidly took off from a patch of water lilies and headed for some secret spot farther into the swamp, undisturbed even by canoes. Amid this serenity, which seemed to cloak the lake and forests and mountains with a preternatural harmony and peace, my friend surprised me with the remark that today was Independence Day. Whatever noisy celebrations were going on seemed far, far away from this quiet world. But being in New England, one could not keep from one's mind the images of lanterns being hung in the belfry of Old North Church, Bunker Hill, and the shots, fired by New England farmers, destined to be heard round the world. Political freedom is to be cherished indeed. But there is no political freedom that is not indissolubly bound to the inner personal freedom of the individuals who make up that nation, no liberty of a nation of conformists, no free nation made up of robots. This book seeks to illuminate this inner personal freedom underlying political liberty. When I mention political liberty in the following pages, it will be generally as illustration. This personal freedom to think and feel and speak authentically and to be conscious of so doing is the quality that distinguishes us as human. Always in paradox with one's destiny, this freedom is the foundation of human values such as love, courage, honesty. 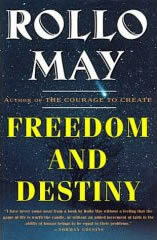 Freedom is how we relate to our destiny, and destiny is significant only because we have freedom. In the struggle of our freedom against and with destiny, our creativity and our civilization themselves are born.